It’s time to take on the new year in style and the Shop With Us team is paying close attention to our handbag collection! The perfect way to add a stylish accent to our look while toting around our daily essentials, this accessory is an absolute must-have for every fashionista. We already have tons of styles in our collection, but with the new year in full swing, we’re all about stepping out with a fresh design. Our ideal purse is equal parts functional and trendy while being able to make a statement all on its own. We’re also looking to welcome a versatile number into the fold, so we can add a nice touch to our casual ensembles and take our dressier looks to the next level. See It: Grab the Michael Kors Jet Set East West Crossgrain Leather Cross-Body at Macy’s starting at 40 percent off the original price of $168, now $101 in multiple colors while it’s still in stock. Not feeling it? Check out other Michael Kors bags at Macy’s! 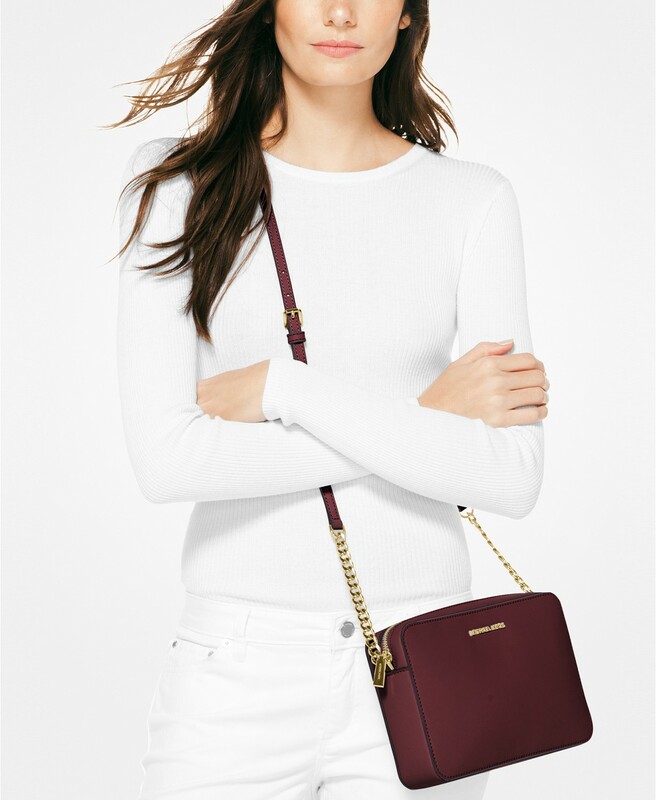 While there are tons of designs that easily meet our requirements, the Michael Kors Jet Set East West Crossgrain Leather Cross-Body bag is truly a special creation. Designed with textured leather construction, this bag exudes a luxurious flair that will complement our year-round wardrobe. Sophisticated yet street-chic, this minimalist purse serves up the ultimate cool-girl vibe we love. Made with a roomy interior, we love that we can store all of our essentials ranging from our smartphone, keys, wallet and more without the annoying bulky look. There are also two interior slip pockets that work to keep our small valuables secure with easy access. The perfect pick for hands-free convenience, this style will easily become our go-to for our next shopping trip! What we love most about this design is the adjustable strap. Unlike other cross-body offerings, this style allows Us to achieve the perfect fit over our shoulders with ease. Complete with gilded hardware along the carry strap, zipper and logo, this purse provides a polished element any fashionista would swoon over! The luxe teal and silver offering is giving Us all the feels! A great style that can easily complement our color-block ensembles and more, we plan on adding this handbag to our everyday lineup. This beautiful hue is always on trend, so we plan on having fun mixing and matching our looks all year-round. For days when we’re looking to add a bold hue to our look, the oxblood and gold number falls right in line. A nice mix of burgundy and cranberry red shades, this bag will add a nice accent to our dressy wardrobe that won’t go unnoticed. We also love that this purse is made with gold-tone hardware for a simple, yet classic style. Best of all? We are elated that we can scoop up this find without having to leave a dent in our wallet! Normally retailing for $168, we can now enjoy a 40 percent off markdown on select styles, leaving Us with a $101 price tag! Macy’s shoppers are totally impressed with this cross-body handbag! Many reviewers love that this purse is super comfy and easy to wear, while others dig the top-quality construction and superior durability. Shoppers also like that this style is perfect for traveling and running errands, while others appreciate that the bag is sturdy and fits a large sized wallet, sunglasses and keys with extra room to spare. One reviewer noted that this design is extremely spacious throughout with being bulky. We can’t wait to hit the streets with this purse and we plan on wearing boyfriend jeans, a V-neck tee, knee-high boots and a moto leather jacket for our next concert look. For days when we’re heading to the office, we’re pulling out trousers, mules, a peplum top and a top coat for a smart-tailored ensemble. We can even keep our look casual with leggings, a tunic, a suede coat and loafers to run errands in style. Thinking of a relaxed outfit? No worries! We can wear joggers, slip-on sneakers, a long sleeve tee and a jean jacket for an effortless look. We live for a design that will kick our style into overdrive and this cross-body number will never disappoint. If you ask Us, there is always room in our closet for a new handbag and this style will make a fabulous addition. A chic creation that can easily transition from work to play with ease, it truly doesn’t get any better than this! Start your new year on the right note and grab this cross-body bag at a great deal today! See It: Grab the Michael Kors Jet Set East West Crossgrain Leather Cross-Body at Macy’s starting at 40 percent off the original price of $168, now $101 in multiple colors while it’s still in stock.